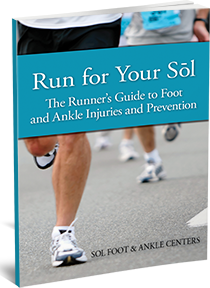 Diagnosis and treatment for runners and athletes of all ages. Whether you’re running a marathon, playing soccer, basketball, in boot camp or an exercise class, your legs and feet take a beating, and sometimes pain and injuries happen. Our goal is to help you heal quickly so you may return to the activities you enjoy. Heal your injury fast by getting the right treatment, the first time. Choose a sports medicine podiatrist. Shin Splints - This pain typically occurs along the shin bone and can develop after increased running and physical activity. Plantar Fasciitis - Plantar fasciitis is the most common cause of heel pain. It occurs when the plantar fascia—the thick band of tissue in the bottom of the foot that goes from the heel to the toes—becomes inflamed. Achilles Tendon Injuries - Achilles tendon injuries are common among runners and athletes that place extra stress on the calf muscles, Achilles, and feet. Achilles injuries may start off as a small tear but continue to progress the tears can become larger causing scar tissue to develop. Ankle Sprains - Sprained ankles are extremely common when athletes are running around, with nearly half of all ankle sprains occurring during athletic activity. During the sprain, the foot twists turns and rolls beyond its normal position. Whether it's a minor ankle sprain to a severe ankle sprain learn to know the signs. Foot Sprains - A foot sprain is a common injury to the foot caused by sudden jarring, twisting, and/or rolling causing the tissues to tear causing pain and swelling. Stress Fractures - Stress fractures are a common overuse injury among runners and athletes. If you are especially active, the repetitive motion of your foot hitting the ground repeatedly over a prolonged period of time can slowly start to weaken one or more of the foot bones which can result in a crack in the bone called a stress fracture. Iliotibial Band Syndrome - Iliotibial band syndrome is one of the most common overuse injuries among runners, and it occurs when the iliotibial band becomes tight or inflamed. When your iliotibial band is injured, moving your knee can be very painful. Kid's Sports Injuries - Children's sports injuries to the foot and ankle are quite common with the ever-increasing involvement of children in organized sports at younger ages. The best way to gauge the seriousness of an injury is to go through an injury checklist. Schedule an appointment with the Sports Podiatrist, Richard Graves, DPM who is widely regarded throughout the Long Beach area as the podiatrist to see if you have a running injury or sport related foot or ankle problem. ?What is a Foot Fracture? ?Who is Most Likely to Get a Neuroma?